Tap for more information or to stop the app. If I tap and Force Stop the Weather app, it comes back before long. How can I really keep the Weather app from running in the background? Or, if I want it to run in the background, how can I prevent this notification from constantly appearing? [How] can I prevent this notification from constantly appearing? If you long-press that notification you would be given the option to turn off the notifications for that app. 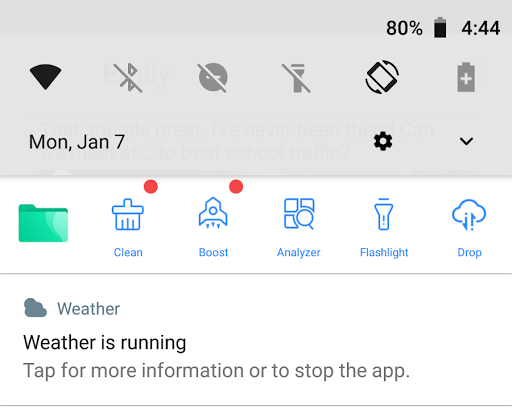 Since it is Android Oreo, you may even get the option just to turn off that particular category of notification from Weather app. If that doesn't work out for you, than I suggest you try MacroDroid. You can detect that notification and clear it automatically and immediately. Action: Notification → Clear Notifications → Select your application → fill the details mentioned above verbatim for the notification received. The next time the notification would show up, the trigger would automatically fire up the action which would immediately clear the notification. You can delete the app for your user account (the default user). Know that the only way to reinstall that app again as a system app is to factory reset. Note that removing a system app can cause boot issues, so proceed with caution and backups taken beforehand. However, I suggest you try disabling it first. adb shell pm enable PACKAGE_NAME        # enables the app for the user, if you must need it again, regardless of how the app was disabled. Sorry, have to downvote this. I used to have an identical issue with another app. Long-pressing that notification gives "Android System" as the source app and no way to disable it. Disabling the app might be the only solution AFAIK, but probably unwanted for an OEMA Weather app. @iBug I didn't really keep my answer limited to disabling it. I have given three solutions. One for disabling the notifications, the other of using MacroDroid and the last one of disabling/deleting it. None requires root access so they all are open for everyone to try. I see no reason why the downvote should be based on just one of them. I found the answer really helpful and detailed! Thanks for that. I uninstalled the app because I didn't want that the positioning system for the weather app can always track me. [SOLVED] How can I force-stop all user applications that are running? Constant location requests from Facebook - how to turn off?